Where to get it: Stockyard Burgers & Bones, Marietta, Ga. Ingredients: Bourbon, blood-orange ginger shrub, rosemary-sage syrup, Campari and lemon juice, garnished with pickled ginger and an orange slice. About the drink: The name comes mostly from the drink’s color, and warns guests that it’s not what it looks like. With Asian ginger, American bourbon and the tangy herbaceousness of the syrup, this cocktail is more than meets the eye. A look at the trend: The use of fresh herbs and housemade shrubs in cocktails isn’t new, but bartenders are getting even more creative in using herbs and spices to develop rich flavors and scents from a wide variety of plant-rich syrups. 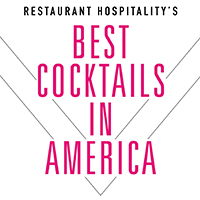 This year’s contenders included some complex layering, from gin infused with fennel or vodka spiked with turmeric, to cocktails enlivened with curry or shaved bonito flakes. Using fresh herbs is a natural extension of the farm-to-table movement, said Adam Disser, bar manager at Stockyard Burgers & Bones. Disser uses fresh rosemary and sage to make a simple syrup, which is left to steep until it cools, developing a rich flavor from the herbs. The shrub, made with blood orange and fresh ginger, comes from a local producer called 1821. Disser garnishes the cocktail with a “flower” of pickled ginger within an orange wheel, which is floated in the drink.